The weather is starting to change and with that comes a need to moisturize skin to protect it from the elements. Sometimes we forget how much tender loving care our hands and nails need. Save yourself a few coins and check out this diy manicure that will make your nails look youthful and refreshed! 1. Clean: Use a non acetone polish remover to remove old nail polish. Next, take a mild soap and wash your hands and nails, make sure to clean out any debris that may be trapped beneath your nails. 2. Soak your hands in a bowl of warm water for 5 minutes, dry and then add cuticle oil to your nail bed and cuticle. A great choice for cuticle oil is grape seed, vitamin E or olive oil. Let the oil soak in for 3 minutes. 3. Use a cuticle pusher to gently push back the cuticle on each of your nails. 4. Remove excess oils with your nail polish remover and then apply a thin clear base coat to your nails. 5. 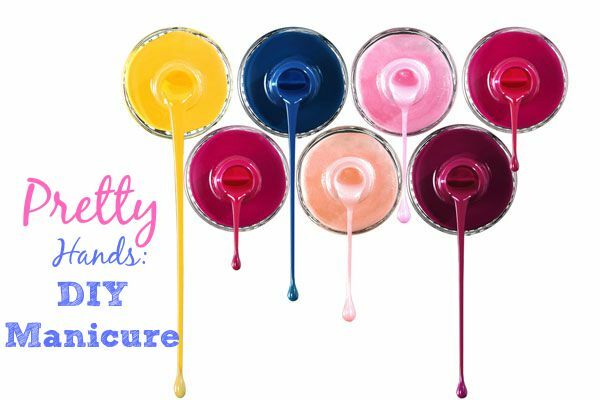 Paint your nails with 2 thin coats of your favorite nail polish color and finish with a quick-drying top coat. After nails are completely dry, apply lotion or moisturizer to hands. *Bonus Tip* Use a q-tip dipped in nail polish remover to correct where you may have painted outside of your nails. With just a few products, you can get gorgeous manicured nails right at home! Love the Fall colors from Essie. Will definitely have to order a few. Thanks for the lists. Any recommendations for a good hand moisturizer? I like Aveeno products and derma e. Also I like to use coconut oil to moisturize my skin too. Can you tell me a good brand of coconut oil? I use any coconut oil that doesn't have added harsh ingredients in it. I get my coconut oil from the Vitamin Shoppe in liquid form. Essie makes the best polishes and their brush does make it easy to get a salon quality job at home. I think I am going to get that blue from Essie, I love it. They sure do and I also like Opi as well. Thanks so much for sharing my post girl! Good points about taking care of the cuticles! Easy steps to follow! Glad you found the steps easy to follow Robin!